It will probably happen to most people at some point in their lives. You will be driving along, and suddenly, your car’s temperature gauge shoots ups and steam starts pouring out from under the hood. Much like people, cars are more apt to overheat in extremely hot weather which is, not coincidentally, the worst type of weather in which to be stuck on the side of the road. Here are a few things to know for when it happens to you. As soon as you notice your temperature gauge rising, shut off your air conditioner in order to reduce the draw on the engine. This will help reduce engine temperature. Open your windows to keep yourself cool. If that fails to lower the temperature, turn on the heater. This may sound strange, but by engaging the heater, the heat from the engine will be blown into the interior and then out through the open windows. 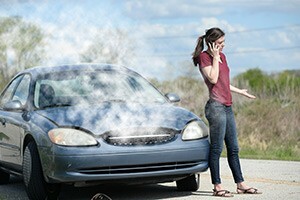 If you notice steam coming from underneath the hood, pull over as soon as you can safely do so. Chances are your radiator is about to boil over. Open the hood and just sit there while your car cools down. Do not, however, try to open the radiator cap to check the water. Wait until the engine and radiator have cooled down. If you open the cap when the water is boiling, you are likely to be splattered by scalding water. Wait until the car is cooled down to add water back to the radiator. Although hot weather is the most common cause of overheating, other mechanical issues may sometimes be to blame. For example, a faulty thermostat or a leak in the cooling system may cause a car to overheat. Once you get back on the road, be sure to get your car thoroughly checked if the problem occurs again.